It's not just you, those annoying calls from government imposters were the top reported complaint to the FTC. Consumers reported losing $488 million to all types of imposter scams, with a reported median loss of $500. Unfortunately, Susan Mayorga's mother lost way more. Last year, she sent $15,000 to someone in Baltimore claiming to be her granddaughter and needing money to get out of jail. "Saying, 'Grandma help me, I'm in trouble,' " Mayorga said. "[She] ran to the bank, ran to UPS and sent overnight $10,000." That was one of two payments. Mayorga tried to call UPS to stop the delivery but was too late. While the "grandparent scam" is popular, government scams made up nearly half of the 535,417 imposter scams reported to the FTC in 2018. These include fraudsters posing as the IRS or Social Security Administration demanding money or deceiving people into revealing their social security numbers by saying their number has been deactivated. The FTC said social security numbers are never suspended and the Social Security Administration will never require you to pay to obtain one. The FTC's advice is to ignore these calls and then let them know. 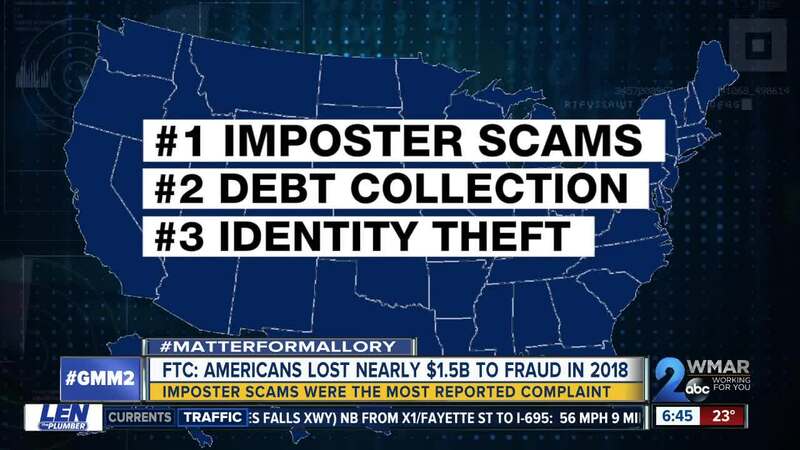 In total, consumers said they lost nearly $1.48 billion in fraud in 2018, up 38 percent compared to the previous year. Debt collection complaints dropped to second place after claiming the top spot the last three years. Identity theft was the third most common complaint. In Maryland, identity theft reports were the most common, narrowly beating out imposter scams. Marylanders reported losing a total of $18.2 million to fraud in 2018 with a median loss of $350. Marion Winik thought she knew better, but in an effort to reverse fake iTunes charges, she ended up losing $100 to a scammer. "Eventually, I drove to CVS with them on my cellphone, bought an iTunes card, and they told me to scratch and read the number to them, and I did," Winik said. "About one second after I hung up. I realized there is no way this is Apple and I'm not getting any money back, and I just gave them $100." Another surprising but consistent finding was that for the second year in a row, people in their 20s were scammed more than those in their 70s. However, the older age group ended up losing hundreds more; $750 compared to $400. The FTC wants you to tell them if you fall for a scam. Your report goes into a database that law enforcement agencies can access. They can use that information to research cases, identify victims and even track possible targets. To report a complaint, click here .